The NEW HyWEAR is designed to significantly reduce handling and processing time per item compared to conventional scanners or Hand-Held readers. Freeing up works hands makes the work faster, easier and more efficient. The powerful electronics identifies 1D and 2D barcodes, UHF RAIN RFID tags or both as a hybrid data collection tool. The device is installed on a comfortable wrist strap, leaving the user´s fingers, hand and arm free to move. The use of HyWEAR compact saves several seconds when scanning a barcode or reading an RFID tag per item, compared to conventional scanners or Hand-Held readers, by eliminating the handling of a Hand-Held device usually used to scan items. The data collected using the HyWEAR takes place in the same motion sequence as handling the item. This eliminates time-consuming movements and unnecessary workloads. HyWEAR compact´s state-of-the-art WiFi offers the highest level of convenience with the ability to roam from one radio cell to another without special receiving stations. HyWEAR compact has a high capacity, long-life, rechargeable battery that powers the device for the duration of a working shift. Should the battery require replacement during a work period, it can easily be replaced with another fully charged battery. Depending on the version, it identifies either 1D and 2D barcodes, UHF transponders (865 – 928 MHz) or as hybrid variant barcodes and UHF tags. 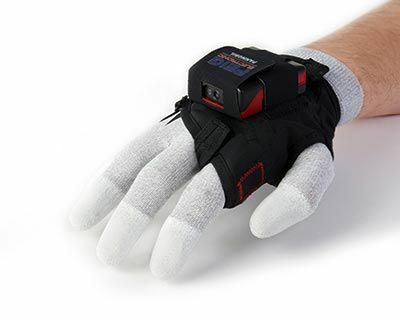 The barcode scanner is triggered by a specially developed Easy Scan trigger on the index finger of the cuff and changes after a defined period of non-use in a power saving mode. In addition to WiFi 2.4 GHz / 5 GHz with roaming function, HyWEAR compact offers with Bluetooth 5.0 the latest wireless technologies. For the wireless transmission of the collected data to the desired ERP system FEIG provides an SDK. HyWEAR compact is an ideal for use in warehouse, distribution, manufacturing, baggage handling, parcel delivery and logistics operations where workers physically handle items such as picking, packing, delivering or moving goods in the performance of their job while also tasked to collect data. As a wearable device, the worker’s hands are completely unencumbered to pick up and move items.